There is a time and place for everything. For example, there is a time and place for you to carry that that big shoulder strap bag you have, but that time & place is not on trips to and from your dorm room to class. College textbooks can be heavy, and walks to from your dorm room can be long. So why not give that purse of yours a rest, and use our Flipper Jewelry Clutch to carry some of your important belongings in college? Larger than a wallet, but smaller than a purse, our cute clutch is made to carry anything from dorm ID cards to jewelry. With four zip pouches, and two that can be removed, our clutch can easily hold all of your must have dorm room id cards. Keep your license in the front zip pocket and your money and keys in one of the other three compartments. Think you don't need all of this space? Trust us, in college staying organized and keeping all of your important items in one place will save you so much stress. 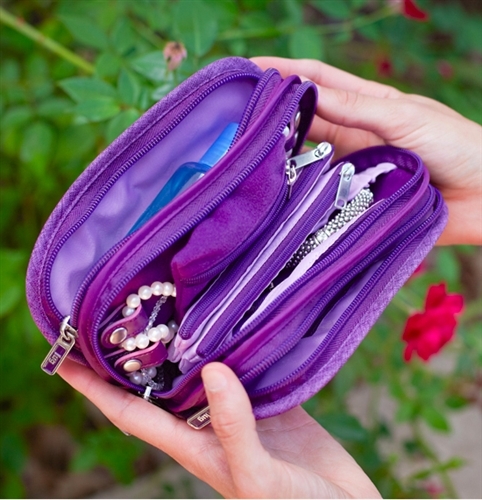 Our dorm clutch is also waterproof with necklace loops that will keep your jewelry from getting tangled. If you love jewelry, then you'll love being able to keep some of your favorite necklaces with you on campus in case you want a quick change. Even if you love your big purse, you'll love being able to just grab our clutch and run out of your dorm room with all of your college essentials in hand.